Machine sewing for the absolute beginner, for under ten dollars. 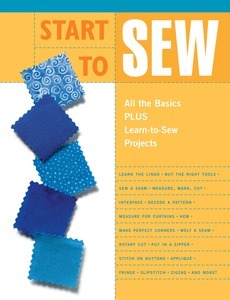 Start to Sew is the perfect first book for new sewers. Thorough instructions and step-by-step photographs expertly guide beginners through the basics of sewing. At a value price under ten dollars, here is everything they need to get started, from buying supplies to sewing a seam. Six projects teach new skills, each project building on the next, while creating a real dacor or fashion project. Whether the goal is to teach a kid to sew, decorate your home, figure out how to use your first sewing machine, or experiment with a wonderfully creative craft, Start to Sew makes sewing fun and successful from the start. Creative Publishing international has also created Sewing 101, Quilting 101, and Home Decor Sewing 101, as well as the Singer Sewing Reference Library.